When Alice steps through the looking-glass, she enters a very strange world of chess pieces and nursery rhyme characters such as Humpty Dumpty, Tweedledum and Tweedledee and the angry Red Queen. 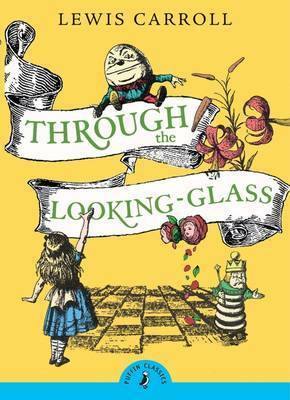 Nothing is what it seems and, in fact, through the looking-glass, everything is distorted. Lewis CarrollLewis Carroll's real name was Charles Lutwidge Dodgson. He was born on 27th January 1832 at Daresbury in Cheshire. He studied at Christ Church, Oxford University and later became a mathematics lecturer there. He wrote Alice's Adventures in Wonderland (1865) and Through the Looking Glass (1872) for the daughters of the Dean of Christ Church. He was very fond of puzzles and some readers have found mathematical jokes and codes hidden in his Alice books. His other works include Phantasmagoria and Other Poems (1869), The Hunting of the Snark (1876), Rhyme? And Reason? (1882), The Game of Logic (1887) and Sylvie and Bruno (1889, 1893). Dodgson was also an influential photographer. He died on 14th January 1898.